Remember the mancession? People started to see it more than a year ago, when male unemployment was racing past 10 percent months before the official rate hit double digits. The difference between male and female unemployment hit an all-time high in 2009. The reasons were fairly straightforward. The overall decline in manufacturing gave men a running start. The housing bubble both created and later destroyed jobs in the residential construction industry, where nine out of ten workers are men. Combined, manufacturing and construction have lost more than 2.5 million jobs in the recession. Denmark's story is pretty extraordinary. For every 100 newly unemployed women, 182 men lost their jobs in the first year and a half of the recession. 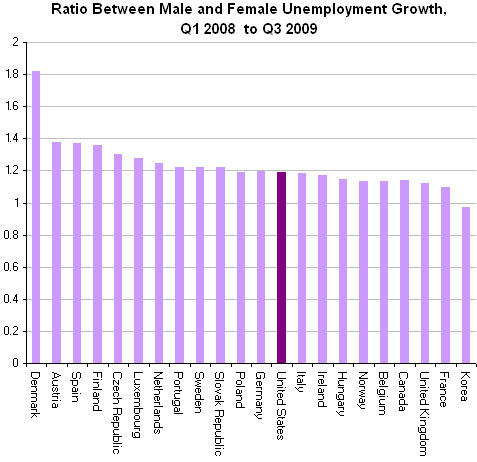 Outlier alert: South Korea was the only OECD country where female unemployment grew faster. For more on the mancession, read Dan Indiviglio's great piece on the Fed predicting a rough road ahead for men. I have my own thoughts on the possible she-covery here. In short, the Council of Economic Advisers predicts that of the top five fastest growing job industries, three are within the health care and education sectors, where women are disproportionately employed.